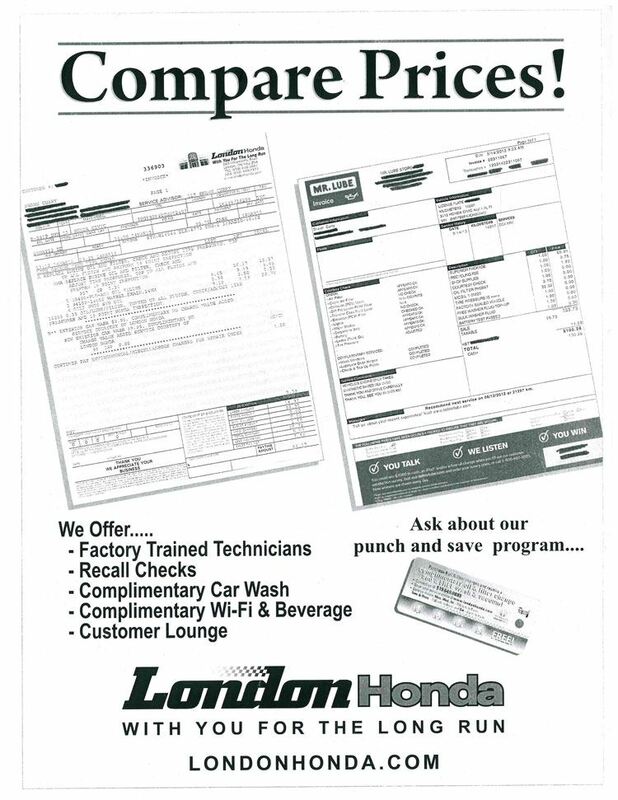 No one knows your Honda like our experienced team of Technicians and Service Advisors. We’re committed to you and your vehicle. Whether you’re coming to us for an oil change or vehicle service, our factory-trained technicians will ensure that all the services and repairs completed on your vehicle will be completed quickly, efficiently and in accordance with strict Honda standards and warranties.... every time! And, we understand that your time is important. So we’ve made booking a service appointment even easier. Just click on the Book a Service Appointment button anywhere on our website. It’s simple, fast and available 24 hours a day 7 days a week. You can also reach one of our Service Coordinators by phone at (519) 690-8343. Remember - Don’t open your hood to strangers; bring it home to London Honda. Punch & Save Program - Purchase 4 oil & filter changes and receive a complimentary 5th oil & filter change plus a FREE wash and vacuum!